Is it a random logo or there is some profound meaning behind it? What is the process behind your corporate brand identity? Before starting out with the brainstorming session ask these questions and make sure you get them absolutely clear. WHY your brand does WHAT it does? WHO is your target market, and WHAT is your promise to the customer. If you get these questions truthfully, you are on the right track to build a successful corporate branding strategy. Ronald McDonald (the clown). Fast Food. Somewhat tasty &unhealthy food. Burger & Fries. Oh yes, the happy meal too. Now for the technical stuff. If there is one thing that you need to develop & maintain a strong brand, it is consistency. Businesses fail and succeed based upon the amount of consistency they carry with the brand. 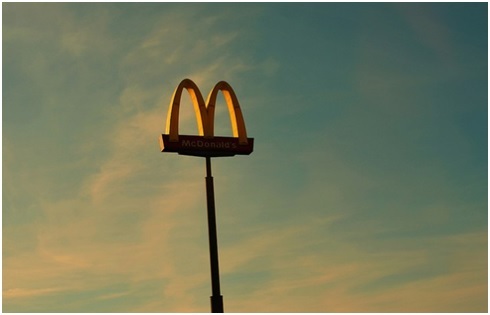 McDonald understood the concept of branding quite well. Everything they do is branded. For instance, you will never see McDonald’s logo in pink, just like you will not getfilet mignon in the serving. All of their marketing campaigns are integrated in the same manner. Same colors, same logo, and even the same tagline. With that in mind we have gathered some best publically available brand guidelines that we have brainstormed for you to follow. Whether you are looking for documented guidelines or any general form of guideline here is your chance to grasp some flavor of it. A cellular company from Australia with a knack. You might not have head of this groundbreaking brand, but trust me when I say they are making some good waves out there in the market. Now is the good time to look into this brand and learn something they are doing right. If you are looking for typography inspiration do check out this brand. KAE brand message is conveyed beautifully by the fonts they use. Huge fonts capture your attention in a glance and you glued to find out more about the brand. A rich brand with impressive use of Sans Serif fonts and over the top colors that makes the design even more desirable. Branding a television channel is a stimulating task. And Centric did what can be dome in the most efficient way possible. Using duotones photos for grabbing instant attention is now a common trend which most of the marketers use. The trend was started by Spotify. If you are short of ideas on design, Centric is a great place to start. One of the best treat of great companies is they do what they do best and then they teach how to do it better. You might consider that ‘do and dont’ are enough to judge the brand but in reality it is the why that is important. Why do brand do what they do? Skype laid out the best possible reasoning on why a brand identity is viral for your success and the guideline is quite simple to follow. Among all the brands one brand I love the most is Amazon. No matter how many brands win this war, for me, Amazon will top the list in every war. With consistency in all elements of the ads Amazon created a voice that is highly integrated in all forms. Even the CTA done by Amazon is quite fascinating. If you want to learn something great today. Visit the guidelines set by Amazon. Being transparent is one the best things brand can do for people and others to lay a foundation stone for a promising brand identity. Originally offering the accessories of camera this brand took one step ahead to explain what they do best. With logos, voice, colors, typography, and must more this brand made a 13 pager booklet that can be great guide for you. Creating a brand identity is not just making the logos right or doing the website design, it is about understanding the brand and telling your story in the most persuasive manner. Here were some of the guidelines which I found pretty convincing to think of my own brand policy. I hope that these will benefit you too and you will get some great ideas to create your unique corporate brand personality.